Hyderabad, the city of Nawabs is the capital city of Telangana state. Like any other city, Hyderabad too has a rich heritage to narrate in every nook and corner of the place. The city which was the capital of the Nawabs now is growing to be the capital of the IT sector in the country. Like other major cities in the country, here too one can witness the mad rush hours, the endless noise, the rush to survive and flourish and many more things which end up giving a lot of stress to its residents. The folks here too, wait for the weekends to slow down and relax, and visit various locations in its vicinity from local street food places to historical places and much more. For the residents of Hyderabad, here are a few weekend getaways from the city which would help you rejuvenate yourself and would prepare you to handle the week ahead with ease. The highly active city of Guntur is known for its historically important monuments which one can find alongside the industrial and business organisations. The place is home to many parks, museums, forts, caves and many more places which would keep you occupied. Uppalapadu is a village located near the city which is well known for its bird sanctuary and is home to about 40 odd species of migratory birds which come here all the way from Siberia like the pelicans and the white ibis. The Kondaveedu Fort has 21 stupas and many temples along with their magnificent entrance towers and pillared halls which are all built atop a hill, which one can trek up. The Undavalli caves, which are carved out of solid rock on a hillside are said to have been built sometime during the 4th-5th century. The caves have temples which are dedicated to Anathapadmanabha Swamy and Narasmiha Swamy. The city of Guntur is around 267 km from Hyderabad. The former capital city of Andhra Pradesh, Kurnool is famous for its historical origins. The city is located on the banks of the river Tungabhadra and also has the Hundri and Neeva rivers which flow through it. The place is well known for the Belum caves, which are the second largest and longest caves in the Indian subcontinent. The caves are centuries old and grab the attention of all its visitors, irrespective of their age group. If you enjoy history, then head to the Konda Reddy Fort which was built during the 14th -16th centuries. The fort has inscriptions which are engraved in ancient Persian and Arabic. The natural rock formations at the Oravakallu rock garden offer you a breathtaking sight which should not be missed. Kurnool is located at a distance of 213 km from Hyderabad. At the village of Hampi, one would come across the ruins of the once glorious Vijayanagara empire. A UNESCO World Heritage Site, Hampi is home to several temples and other monuments which stand tall to narrate the stories of the bygone era. The Hazara Rama Temple complex though in ruins is well known for its delicate carvings and inscriptions which narrate stories from the Ramayana. The most renowned amongst the ruins is the Vijaya Vittala Temple complex which stands proud and has become the face of Karnataka Tourism. Hampi is located at a distance of 377 km from Hyderabad. Home to many ancient temples, Karimnagar was at one point of time a hub of Vedic learning. Archaeological excavations have proven that since pre historic times the place was inhabited by human settlements. At a distance of 16 km from the city centre is the Elgandal Fort which is located on the banks of the Manair river which is historically significant. Those who are looking out for spiritual rejuvenation, you can make visits to the temples of Sri Raja Rajeshwara, Dharamapuri, Kondagattu and the Mukteshwara Swamy Temple. Karimnagar is located at a distance of 164 km from Hyderabad. 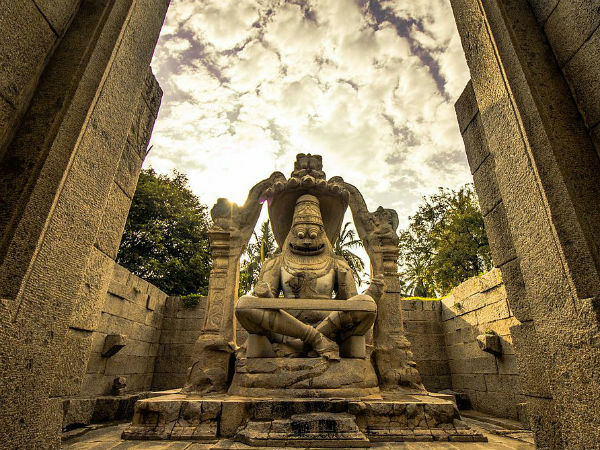 The city of Warangal was ruled by the Kakatiya dynasty. The rulers of this dynasty constructed several monuments such as forts, stone gateways, temples, etc. The Swayambhu Temple here which is dedicated to Lord Shiva and the Ramappa temple which is located near the Ramappa Lake are fine examples to show the grandeur of the dynasty. Another major attraction here is the Bhadrakali Temple which lies at the heart of the city. The Warangal Fort which has massive stone gateways known as Kakitya Toranas and the pillars which surround the Swayambhudevi Aalayam is a major draw. The star shaped thousand pillar temple is a heritage structure which showcases the sculptural beauty of the Kakatiyan dynasty. The historical town is around 148 km from Hyderabad. Bhadrachalam would be an ideal choice if you have an inclination towards spirituality and also if you are a huge fan of mythological history. The town of Bhadrachalam is located on the banks of the river Godavari. Rama is believed to have visited this place during his exile time and also stayed in the forest which is located in this town. With a charm of its own, the mighty dam is indeed a beautiful place to be at. This place also has important historical roots and at one point of time it was a prominent centre of Buddhist teachings. The size of the dam would leave you spellbound with its unbelievable sunsets and scenes which would clear your mind of all troubles which the city gives you. The dam is around 165 km from Hyderabad. The historical town of Srisailam holds a prominent place in Hinduism since time immemorial. The holy town is located at the centre of the Nallamala forest in the Kurnool district. The town houses one of the 12 Jyotirlinga temples in its vicinity. One can visit the Bhramaramba Mallikarjuna Temple atop the Nallamala Hills. Another major draw here is the Akkamahadevi caves which can be reached via an hour long boat ride from the Patala Ganga. Srisailam is located at a distance of 213 km from Hyderabad. Adilabad is home to a multicultural society and was once a strong bastion of the Nizams. The Mavala Lake which was built during the Nizam rule is located on the outskirts of the city which also has a park adjacent to it. The Kuntala and Pochera Falls are major attractions here besides the Shivaram Wildlife Sanctuary where one can spot marsh crocodiles in the Godavari river. The town is located at a distance of 303 km from Hyderabad.